During a brief but busy trip to Oregon Monday, January 28, Agriculture Under Secretary Dallas Tonsager highlighted opportunities to increase public-private collaboration and innovative financing models for rural community and economic development. 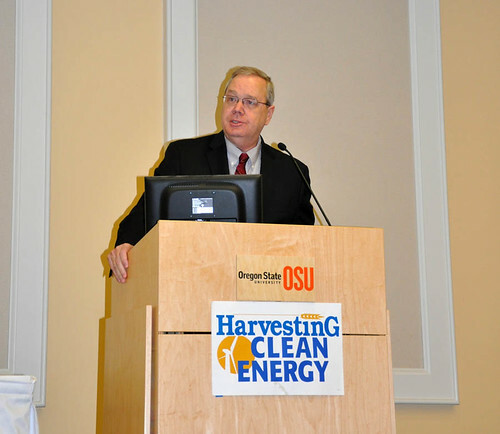 That morning, Mr. Tonsager delivered the keynote address at the Harvesting Clean Energy conference in Corvallis. Later that day in Portland, Mr. Tonsager sat down with a diverse group of business, technology, education, agriculture, finance and state government representatives to stress the importance of inter-entity teamwork to achieve a common vision for a self-sustaining, prosperous rural America. Under Secretary Dallas Tonsager, in Oregon, (center of table) meets with business, technology, education, agriculture, finance and state government representatives to discuss job creation. The discussion was part of an ongoing, nationwide dialog led by USDA Rural Development to shepherd in a new era of public-private collaboration and investment to create and maintain the conditions necessary for an economically thriving rural America. The talented people and partners working alongside USDA here in the Northwest will, undoubtedly, continue to generate exciting ideas and successful new models for development that will be shared and replicated across the country. We thank all of the local leaders, organizations, stakeholders and the many others who share in this important work! Under Secretary Tonsager delivers the keynote address at the Harvesting Clean Energy Conference in Oregon.